Embroidering your company logo on apparel or other promotional products can be a great way to build brand awareness and exposure. Logo embroidery lo oks neat & professional, and it is a good alternative to screen print. Embroidery makes your logo stand out while also calling attention to your business, especially when used on many types of items and materials. Here are some uses for logo embroidery to consider when it comes to building your business’s brand and identity. Logo apparel is a great way to market your business and create exposure without having to say a word! Custom embroidered work uniforms offer a dynamic and polished way to promote your business, especially when embroidering on a polo shirt for your employees to wear while they are at work. Promotional items such as caps with your embroidered logo on them make great items to give away to customers and clients, or for your employees to wear when they are not at work. Taking advantage of the additional exposure for your company will benefit your business for the long-term. Another useful aspect for embroidered hats can be to hand them out at business conventions, company meetings or parties. Also, always having a few embroidered caps or T-shirts on hand is a good idea, as you can hand them out to clients or business partners. Put your logo out on the golf range with embroidered golf shirts and towels. Giving your best corporate clients a special golfing gift with your logo on it can go a long way. By the same token, embroidered athletic shirts that can be worn to picnics or other sporting events are a great and sporty way to promote your business while you and your team are not at work. If your company is sponsoring a sports team, have your logo embroidered on the front of the team’s shirts, such as a baseball or soccer team. Don’t overlook the rest of the family! While women and children may not often sport golf shirts or baseball caps, have some embroidered items on hand for them as well. Kids sized T-shirts, embroidered tote bags, and lunch bags are a great way to get everyone in the family wearing your logo! Logo embroidery can be used on most types of fabrics, but remember, the results may vary considering the thickness and weight of the fabric you are using. So consult an expert before selecting a fabric for the embroi dered logo. Dress up your embroidery! What comes to mind when most people think of logo embroidery is short-sleeved polo shirts, but you are not limited to that particular style. Consider a long sleeved dress shirt with your embroidered logo, which is a nicer look for corporate meetings, managerial wear, and a more professional look while still promoting your business and company stylishly. Reward your staff with embroidered loyalty gifts. If you have contests between staff members or sales drives, reward the winners with an embroidered laptop sleeve or a nice embroidered jacket. Reward your top sellers or employees with something special that has your brand on it. Our reward can be an embroidered lunch bag, robe, blanket, towel, hoodie or duffle bag. 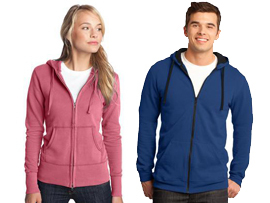 Make special apparel to wear at trade shows or conferences. Aprons embroidered with your logo for employees to wear while working at special trade shows will make an impression, especially if you are in the restaurant industry. A special piece of apparel that is only worn during special events will provide professionalism and good exposure. There are many different ways to use logo embroidery to promote your business. First, you have to come up with a digitized version of your logo that will work with the items you want to embroider. Vector files usually work best for logo embroidery. Talk with an expert about colors, types of embroidery and what will work best for your logo. Logo embroidery looks clean, neat and professional and can be used in many ways to advertise your business passively for maximum results, so consult a professional screen printer and embroidery expert today for more information.